This Steak and Cheese Stuffed Peppers Recipe is one of my family favorites. A few weeks ago, I discovered just how many options are available when looking for a soft spread. This week, I used one of those spreads to make a twist on 2 family favorites and came up with this recipe. I liked knowing that I was sauteing the vegetables in a soft spread that is made with a blend of oils rich in Omega-3 ALA and has 0g trans fat per serving. The spreads enhance the flavor of the veggies without overpowering or changing the taste, something that’s important to me. 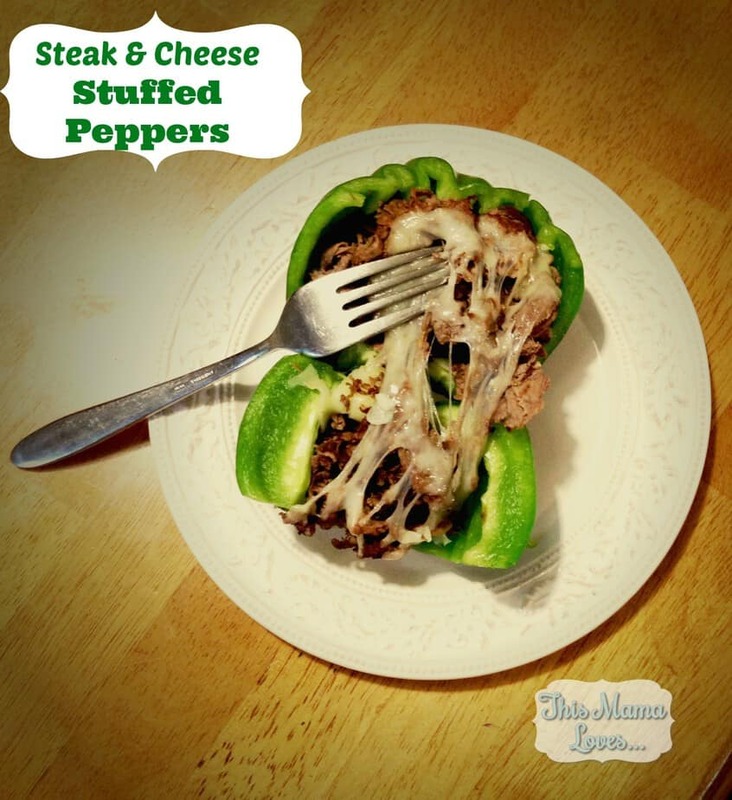 Easy to follow recipe combining stuffed peppers and steak and cheese grinders. In skillet, saute onion and the sliced pepper (I actually dice mine) until soft. Remove onion and pepper from skillet, set aside. *If you LOVE cheese, you may want to add a second piece of cheese about 5 minutes before you remove the peppers from the oven. My family LOVES stuffed peppers and steak and cheese grinders, so I decided to marry the two recipes and see how they’d like best of both recipes combined. Sautéing the veggies before stuffing the peppers really just adds so much flavor to the whole meal! I’m thinking these might be great for picnic dinners- messy the traditional way, but if you top the peppers and use them almost like a bowl with the steak and cheese, it’s really easy to see using these almost as an edible bowl. I love stuffed peppers & this sounds fabulous! Thanks for sharing! I’ve used Country Crock for years. We use country crock. It’s smooth and creamy. I think I’d say Promise because I have high blood pressure and am concerned about heart health. I like “I Can’t Believe It’s Not Butter!” the best — actually tastes better than butter! I want to try the Promise spread! Grilled Chicken Sandwiches With Basil Aioli! I’m soooo making these asap!!! I like Country Crock the best. Your recipe looks really good – I’m saving it to try someday! I would have to say Country Crock! I love that brand of spread. I love making stuffed bell peppers but I normally use ground beef and rice for the inside. I think I might just have to try your recipe the next time I make them. I would most like to try the Brummel & Brown® Yogurt Spread. mmm those look and sound so delciicous! must make for dinner now! I’ll have to give this recipe to my father and step-mom. They love their stuffed peppers! Thanks for sharing. I have a feeling that this would be a big hit with the men in my family! What a brilliant idea! I would love to try this recipe out! My Mom would make something similar but would ground beef and onions only. Looks yummy! I love i can believe its not butter, always will. Yummy! Great way to sneak in veggies in a fun way! I would try I can’t believe it’s not butter. Me too, I’ve always heard such good things about it!! We use country crock here. I have never tried to make stuffed peppers and have never found any that I liked what was stuffed in hem. I think these may be good. Will try. Thanks. My family uses I Can’t Believe It’s Not Butter a lot! I would like to try the Brummel & Brown Spread. We use I Can’t Believe It’s Not Butter a lot! That sounds strange enough to be good. I never would have thought to make stuffed peppers like that. We love peppers so I’ll have to try it. Thanks! We use I Can’t Believe It’s Not Butter! and i Like that it is an excellent source of Omega-3. Brummel & Brown! It tastes delicious, it’s good for you, and it has a great sweet taste!! LOVE it! I’d like to try Brummel & Brown! My first choice would be I Can’t Believe Its Not Butter! We’re a Country Crock house. Thanks! Lemony Walnut-Crusted Fish Fillets with country crock. I would like to try Country Crock. I like both Country Crock & I Can’t Believe It’s Not Butter. My storage issues-finding safe plastic to store in that can also be microwavable! I say I can’t believe it’s not butter! I would like the Brummel and Brown Yogurt Spread. I would like to try the I can’t believe it’s not butter spray. It would be great on my veggies! I Can’t Believe It’s Not Butter!® would be a first choice for me. Thanks for the giveaway post. Now that looks yummy. I make stuffed bell peppers on occasion but have only used ground beef. The steak is a great idea. I think the Brummel & Brown spread would be what I’d like to try. I’d like to try the Imperial butter! I would like the Brummel and Brown Yogurt Spread! Oh and I visited ” It is Good to Know” and would to try the “I can’t believe it’s not butter” spread. A very health and yummy recipe! Will have to try sometime. I would like to try their Brummel & Brown Spread. I love Country Crock. It tastes so good. i can’t believe it’s not butter! i’d like that most. Brummel and Brown – the yogurt sounds like a tasty twist to regular butter! I often use I Can’t Believe It’s Not Butter as a spread for toast. It’s actually very good. I love I Can’t Believe It’s Not Butter (I use it all of the time) and I would love to try the Tortilla Crusted Chicken Breasts! i like country crock. i use it all the time. I LIKE THE Hearty Veggie Frittata WITH I Can’t Believe It’s Not Butter! Brummel and Brown for me. i love my I Can’t Believe It’s Not Butter! but i want to try the Brummel and Brown. didn’t know it was made with yogurt! I’d like to try the Brummel and Brown. Remember it got really good reviews from our news station. I like Country Crock and use it all the time. I like the Brummel and Brown. Country Crock all the way!! I love Country Crock and I can’t Believe its not Butter – those are the only ones I use. Oh man, these peppers look SO good. I was going to make stuffed peppers tonight…. but now I want them this way! May have to put off this dish for a day or so until I can get everything I need lol. I love I Can’t Believe it’s not Butter! My husband makes stuffed peppers, too. We haven’t ever tried steak in them, though. YUM! The Brummel & Brown Yogurt spread sounds delicious and different! I can’t believe it’s Not Butter, I love using it for baking! I will be making these very soon for sure! Yum! The Brummel & Brown spread sounds interesting. Maybe to bake with it? Never thought to add cheese to stuffed peppers! YUM!!!! We love ICBINB, too! We have been using it a lot lately. I would like to try the Promise spread. I seem to always buy country crock, but I have never tried “I can’t believe it’s not butter”. Maybe it’s time for me to try something new! I’d like to try Country Crock. Looks mighty tasty! Thanks for sharing recipe! I would like to try Country Crock the most because it looks to be used in loads of recipes I would like to try. My favorite spread is I Can Not Believe its not Butter because it tastes so good! I like it on Baked potatoes, garlic bread, and in so many recipes. It has less calories! I love I Can’t Believe It’s Not Butter! I would try the Brummel & Brown it seems like it would taste really good! I love Country Crock but I’d also like to try Promise. Country Crock spread would be the one I’d most want to try. I want to try the Brummel and Brown! My husband loves this recipe and we can’t wait to try it with our home grown peppers when they are ready. Oh! This recipe is gluten free. Thanks for sharing! I am adding it to our menu for next week. I”m always looking for gluten free ideas that taste good. country crock is the best! I’d like to try the I Can’t Believe It’s Not Butter!® and would love to try it in the Toasted Breakfast Burritos recipe!